• Heritage Range: Renowned for quality and cleanliness of the seed. • Professional Range: Seed for the professional installer. Includes mixes to suit a wide variety of growing conditions. • Impact Range: Vibrant and colourful mixes to create a feature of any landscaping project. • Conservation Range: Balanced wildflower mixes that provide colour and food to attract wildlife. Wildlife and Insect Habitats Create biodiversity on your projects with our range of wildlife and insect habitats. Wildflower Matting Pre-grown under controlled, specialist conditions, the matting provides instant impact and encourages biodiversity. MDF? Outside? In the Rain? For 50 years? Are you MAD? MEDITE TRICOYA EXTREME is a revolutionary product that will take the construction, landscaping and exterior design worlds by storm. Guaranteed for up to 50 years in the face of the elements, this naturally modified MDF is incredibly versatile and can be used for planters, garden rooms, sculptures, playgrounds, building faรงades, furniture; you name it, MEDITE TRICOYA EXTREME can do it! Editor’s letter Spring is in the air. While gardens are blossoming across the country, the Royal Horticulture Society (RHS) shows begin to welcome visitors across the UK, kick starting with the Cardiff Show mid April. One of the gardening highlights of the year is Chelsea Flower show. Held in the grounds of the Royal Hospital Chelsea since 1913 (apart from gaps during the two world wars), it is the place to see cutting-edge garden design, new plants and find ideas to take back to the drawing board. Of the firms that exhibited at the first Show in 1913, three can still be seen at the Show today: McBean’s Orchids, Blackmore & Langdon and Kelways Plants - a fitting testament to the show’s place in the heart of landscapers and horticulturists to this day. This month we take a look at some of the garden designs featuring this year, as a star studded line-up of UK’s top designers set to impress on Main Avenue. The theme across the gardens this year will be natural habitats inspiring design to promote the need to reconnect with nature. With our mental and physical health very much in the news, the benefits of gardening on our health and the environment will be celebrated across all categories. This theme will run through one of the main feature gardens RHS Back To Nature Garden which is co-designed by HRH Duchess of Cambridge. Also for the first time this year, the main pavilion will house a judged walk-through Show Garden by internationally renowned British Designer Tom Dixon and home furnishings retailer IKEA. Staying with the RHS, Sue Biggs, Director General of the historic gardening society, kindly took time out of her hectic schedule to chat with me about her love of gardening, and to talk about the challenges we continue to face in the world of gardening and landscaping, and how the RHS are trying to address some of these issues. We also take a look at strategies for marketing your business. Whether just starting out or managing a small business that has been running for many years, it is often easy to get too distracted in the day to day running of the business, to consider how and whether you are reaching out to potential new clients. Effective marketing strategies can be the difference between success and failure for any business. As Ffion Llwyd-Jones discovers on page 25, with so many different ways to communicate your brand to a target audience, the process can be bewildering. A good starting point is networking and research at shows such as the prestigious Chelsea Flower Show. It is also worth taking time to visit trade shows such as SALTEX and BTME. Here you will meet people who are always willing to offer helpful advice, trade organisations such as British Association of Landscaping Industries and the Association of Professional Landscapers as well at training bodies. What Ffion’s report did reveal is that many of our industry success stories still consider print advertising a relevant and necessary part of their marketing campaigns. This tied in with social media and digital marketing combine to create a successful means to reach out to the ever changing demographic of end users. 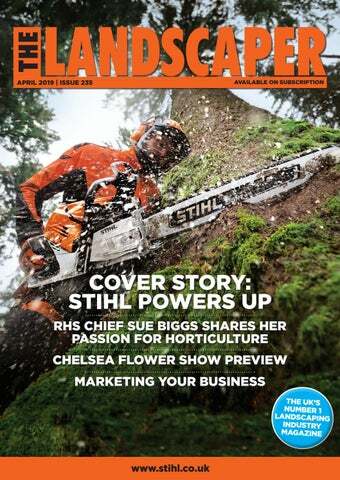 Finally, our cover story takes us back to a rather blustery March day, when I joined fellow journalists at Westonbirt Arboretum in Tetbury and the STIHL team to test drive the power tool company’s latest products. See page 28 for full report. I hope you enjoy the read - and please do keep in touch via our social media. For more information and to locate your local Authorised Husqvarna dealer visit: HUSQVARNA.COM/UK COPYRIGHT © 2019 HUSQVARNA AB (PUBL). ALL RIGHTS RESERVED. The Landscaper is owned and published by Sheengate Publishing Ltd. Nothing in this publication may be reproduced without the written permission of the publishers. Readers intending to purchase goods or services from advertisers should make their own enquiries if in any doubt. Every endeavour has been made to ensure that all the information published in this magazine is as accurate as possible. Neither the publishers nor their agents can be held responsible for any errors or omissions; nor shall they be liable for any loss or damage to any person acting on the information contained in the magazine. Entries open for GIMA Awards 2019 Recognising excellence and innovation, the Garden Industry Manufacturer’s Association (GIMA) Awards will be returning for its 39th year this summer. Taking place at Celtic Manor, Newport, Wales on 4th July the awards have grown into the largest industry gathering, welcoming both retailers and suppliers from the UK garden retail sector. Guests enjoy the GIMA awards last year. Supplier of the Year, and Export Achievement awards. Entry for the 2019 awards is now open. The overall product winner award – the Sword of Excellence – awarded to Neudorff in 2018, completes the awards roster. Previous winners have included Gardena, Fallen Fruits, Willow Wand, Primeur, Burgon & Ball, Deco-Pak, Smart Garden Products, Apta, Vitax and Evergreen Garden Care (previously The Scotts Miracle Gro Company). Each company has benefitted from the wealth of exposure that comes from being named a GIMA Award winner. Vicky Nuttall, GIMA Director says, “The GIMA Awards have gone from strength to strength in recent years. The calibre of entries continues to raise the bar, reflecting the innovation that is driving our industry forward season after season. 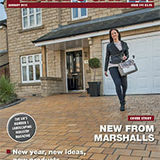 I’ve no doubt that this year our judging panel – made up of top UK garden retailers and consumer and trade journalists, reflective of the omni-channel nature of our industry – will have their work cut out for them as the scale and quality of entries will continue to rise.” To enter the 2019 GIMA Awards, visit http://gima.org.uk/gima-awards/. Closing date for entries is Friday 17 May, with the dedicated judging day confirmed for 18th /19th June. Visit the same web page to book your place at the 2019 awards ceremony. company is well prepared for future growth plans. And as part of these plans Peter role is to spearhead the company’s expansion into the irrigation market as the UK distributor of Rain Bird’s golf, sports pitch and landscape products. Peter, a New Zealander by birth, has a Bachelor of Horticultural Science degree and more than 20 years’ experience across a wide range of irrigation market sectors and installations, 10 years of which have been spent in the UK. Peter can be contacted on 07741 665679. Garden retail show invests in show app Glee, the UK’s leading garden retail show, joins the digital revolution with the launch of its new exhibition smartphone app, designed to provide an unrivalled matchmaking solution to help suppliers and retailers to get the most out of their time at the show. The AI-powered event ‘matchmaking’ solution - from market-leading experts, Grip - will offer benefits for both exhibitors and retailers, utilising a platform that has already proved its worth at many leading events across the globe. Visiting retailers will be able to better measure – and even increase - their ‘Return on Time’ spent at the show, through personalised exhibitor recommendations, and an easy to use meeting scheduling function. The Glee app will also include an overview of all of the exhibition’s wider educational content and seminar programmes, helping retailers to plan their trip around Glee. Glee exhibitors can also optimise their time via the app, as it provides a way to generate more leads, and manage meetings with new, potential and existing customers. Popular exhibitor focussed features of the app include the ability to filter and refine visitor recommendations via Smart Recommendations, as well as Meeting Delegation which enables management of meetings across the sales force. There’s also the Smart Meeting Link which makes it easy to invite existing clients to meetings, and an Inbound Leads section that highlights all the retailers that are interested in your company. The app is also fully integrated with Outlook, Google Calendar and Apple iCal, making it even easier for all parties to stay up-to-date on appointments. The Glee app will be available on Apple and Android from early June 2019.
in our gardens, our outreach and education facilities, we want to create a more sustainable and better society for generations to come. There are seven projects in place, one of which is our fifth garden at RHS Garden Bridgewater in Salford. Bridgewater is the biggest gardening project in Europe and the Society’s first new garden in 17 years. It is a big undertaking and we still need to raise £4.9m to create this inspiring horticultural haven for the North West. But it will be a place of great beauty as we welcome a wider audience and thousands of local schoolchildren to reconnect with nature and learn how to garden. What appealed to you about working for the RHS when your corporate background was travel? The Royal Horticultural Society has always been an amazing organisation. When the RHS position came up, I had already been an RHS member for years, and even though I wasn’t actively looking to leave the travel industry, it was quite simply my dream job and it only took me a couple of days to pluck up the courage to apply. The RHS is the world’s leading gardening charity, driven by a love of plants and the genuine belief that gardeners make the world a better place. They were looking for someone with commercial experience and who could bring teams together, but also for someone who loved gardening. I’ve always recognised and appreciated the benefits green spaces and horticulture can provide, and it’s now more important than ever that people recognise the role plants play in reducing the impact of some of the biggest challenges facing us today. This makes this role so much more worthwhile for me, and far more rewarding than delivering shareholder value. I feel so lucky to work in an organisation with such wonderful people, promoting something I care about passionately, and I hope making a positive difference to as many lives as possible. What’s your biggest achievement is to date? I was extremely proud to receive the award of the Commander of the British Empire (CBE) in recognition for services to the environment and horticulture on behalf of everyone at the RHS who works so hard to help us deliver our charitable work. I was also over the moon to see our membership pass the 500,000 mark. But I think that when we finish delivering all seven Investment projects, then I will be very proud of what we will have achieved at the RHS for the growth of gardening in this country and delivering on our mission to enrich everyone’s lives through plants. the breadth of skills within the sector and the many opportunities in this multifaceted industry. We work with organisations such as British Association of Landscape Industries (BALI) and Association of Professional Landscapers (APL) to provide opportunities for students and apprentices to create gardens at the show. The RHS Flower Show Tatton Park has become synonymous with budding new talent with its Young Designer of the Year Competition. In 2016 and 2017, the show ran its RHS Young Landscape Contractor (supported by BALI) and RHS Young Planting Designer 2017 seeking to encourage emerging talent within the sector. been raised in The London Assembly. We held a Front Garden Summit in 2016 where policymakers, developers, planners and landscapers discussed solutions to start making a difference and 128 grants have been given to communities to turn grey spaces green. The RHS hosted a conference at Tatton Park Flower Show in 2018 to highlight the importance of greening urban spaces and its last three gardens from RHS Chelsea Flower Show have all transformed grey spaces to green after the show. Later this month we will be announcing some exciting news about our Greening Grey Britain campaign, so watch this space! Last year at the RHS Hampton Court Palace Garden Festival, we welcomed landscaping students from BALI as they created a garden under mentorship. It showcased how newcomers can get involved in creating rewarding and inspiring gardens, from the earliest stages of their career as it inspired new talent while celebrating the skills of Landscape Contractors. We’re also delighted to see APL return for 2019’s Festival. Being involved in the construction of a garden, including laying paving and planting, RHS Shows provide Landscape designers with a fantastic platform from which to demonstrate their skills in front of the wider landscape industry and the hundreds of thousands of visitors. Putting you on the spot, which is your favourite RHS flower show in the UK and why? I couldn’t possibly say! Each of the shows really do have their own personality so it’s so difficult to choose between them. I think Cardiff for its vibrant variety of plants and flowers, it always feels as though spring has truly arrived. Chelsea for cutting edge design that never fails to take my breath away. Chatsworth for innovation in an absolutely beautiful location. Hampton Court for its relaxed summer feel and everything I could ever want for my garden, especially as it’s close to home for me. And Tatton Park for new faces, talent and exciting designs I’ve never seen before. Chelsea blossoms for the world famous garden show World renown and quintessentially British, the RHS Chelsea Flower Show returns this spring to The Royal Hospital, Chelsea. Running from 21-25 May, the key theme this year is to encourage people to reconnect with nature Undoubtedly the show stopper this year will be The RHS Back to Nature Garden, a feature garden at this year’s event co-designed by HRH The Duchess of Cambridge and Landscape Architects Andree Davies and Adam White. This garden is key to the RHS’s partnership with NHS England, promoting the physical and emotional well-being that access to green spaces and gardening provides. After RHS Chelsea, much of the planting and some of the landscaping will go to an NHS Mental Health Trust, as part of a national competition run by the RHS. Show Gardens Other highlights to look out for is the garden of seven-time gold medal winning designer Andy Sturgeon, who is back creating a show garden for head sponsor M&G Investments. Drawing inspiration for his garden from nature’s power to regenerate, the woodland landscape will be colonised by young trees, ferns and jewel-like flowers, interspersed with stone platforms and huge burnt timber sculptures representing natural rock formations. Multi RHS gold medal winning designer, Sarah Eberle returns to Main Avenue with a garden celebrating 100 years of forestry with The Forestry Commission. The Resilience Garden looks ahead to the biggest challenges facing our forests in the future, exploring how they can withstand a changing climate and the increasing threats of pests and diseases. A celebration of the environmental benefits of trees, this time within an urban space has influenced the design of The Savills and David Harber Garden by Andrew Duff. The garden seeks to create a beautiful, sustainable woodland clearing within a city, featuring bio diverse trees and greenery known to remove harmful pollutants from the atmosphere. Each Ecoplug contains 283mg formulated glyphosate product. Ecoplug is a registered trademark of Ecoplug Sweden AB. Ecoplug Max is distributed in the UK by Bayer Crop Science Ltd. Technical Helpline: 01954 717575 Email: technical.helpline.uk@monsanto.com For full details including risk and safety phrases, refer to our website at www.monsanto-ag.co.uk USE HERBICIDES SAFELY. ALWAYS READ THE LABEL AND PRODUCT INFORMATION BEFORE USE. © 2019 Bayer Group. All rights reserved. Three gardens on Main Avenue this year represent striking natural landscapes. Last year’s People’s Choice winner Mark Gregory is designing once again for Welcome to Yorkshire, inspired by the canals and waterways found in the West of the county. Jon Snow for Trailfinders is sourcing inspiration from further afield bringing the temperate rainforests of South America to Central London complete with lush planting and dramatic waterfalls. In contrast the The Dubai Majlis Garden designed by Thomas Hoblyn evokes a Middle Eastern feel inspired by the sculptural beauty found in arid landscapes. The importance of having access to nature and green spaces for all ages and abilities has inspired the brief for The Greenfingers Charity Garden designed by Kate Gould. CHELSEA 2019 Artisan Gardens Small is beautiful when it comes to the Artisan Gardens and this year’s line-up promise to inspire and excite as traditional materials and methods are revitalised through new design approaches. A garden celebrating 70 years of land-based education at Kingston Maurward College embodies the artisan approach as the college’s blacksmith, engineering, countryside management and horticultural students will all contribute towards the final design. constantly changing and evolving and are rich and diverse environments where many species can thrive. Vibrant colours and exotic leaves bring rural Africa to central London promoting the importance of Giving Girls in Africa a Space to Grow. Women produce much of Africa’s food, the garden designed by Jilayne Rickards highlights the work CAMFED does to educate and empower those reliant on agriculture in communities hardest hit by climate change to use climate-smart, sustainable agricultural techniques to provide for themselves and their families. Education also underpins the message of The Montessori Centenary Children’s Garden designed by Jody Lidgard, an engaging space to nurture children, teaching them about the natural world and future of horticulture with new technology including hydroponics, aeroponics and vertical planting techniques. Water features prominently in a number of the gardens planned for Chelsea 2019 and lies at the heart of Paul Hervey-Brooks The Viking Cruises Garden, a space created from a water meadow with multi-stem river birch and winding streams running through to a pool and concrete terrace. Meanwhile the Manchester Garden, aims to showcase a city reinvented and one that can truly blow away assumptions and pre-conceptions, as well as inspire and start conversations about the potential of green space within UK cities. The garden explores the themes of resilience and adaptability in urban green infrastructure in the face of climate change, rising temperatures and more frequent weather extremes. Connected to this the garden will explore the use of productive planting within our urban environments to offset the effects of industrial scale farming and rising food miles. Annie Prebensen and Christina Williams were last at Chelsea in 2010 when they won gold and best Artisan Garden, the pair return with a garden celebrating the 50th anniversary of The Donkey Sanctuary, highlighting the vital role donkeys play in improving the lives for some of the poorest and most vulnerable communities in the world. Walkers’ Forgotten Quarry Garden designed by Graham Bodle takes inspiration from a quarry at the bottom of the garden at Walkers Nurseries, featuring reclaimed items and materials from the quarry. The Great Pavilion British horticulture remains at the heart of RHS Chelsea as the UK’s top nurseries fill the Great Pavilion with thousands of immaculate plant varieties on display. For the first time the Great Pavilion will also house a judged walk-through Show Garden by internationally renowned British Designer Tom Dixon and home furnishings retailer IKEA. The immersive garden hopes to raise awareness that it is both possible, affordable and rewarding to grow your own food in the city using sustainable urban growing techniques. Upon first impression, the garden looks like a natural hillside landscape, on closer inspection, the viewer can see a subterranean, and futuristic high-tech garden with edibles and plants growing in an immersive horticultural laboratory. Perennial was and still is a lifeline for us. I don’t know how we would have coped without them. Perennial is your trade charity committed to providing completely free, confidential advice and financial and emotional support to groundsmen in times of need. Whether you currently work as or are a retired groundsman, Perennial is here for you and your family. Visit perennial.org.uk/personal-stories to see some of the people we have supported and how one day we might be able to help you or someone you know. We help with the many challenges during someone’s lifetime, including: Ill health | Disability | Injury | Relationship breakdown | Debt | Job loss | Workplace accidents Bereavement | Old age | Housing and welfare issues | Poverty | Financial hardship No membership is required to access our free services and we are here to take the strain for as long as is needed. You are not alone, call us in confidence: General advice | 0800 093 8453 Debt advice | 0800 093 8456 Visit: perennial.org.uk/help Registered charity nos: 1155156 | Scotland SC040180. Perennial’s debt advice service is authorised and regulated by the Financial Conduct Authority (www.fca.org.uk). Day after day, it turns in an exceptional performance. ZD1211 Zero-Turn Mower: Exceptional manoeuvrability, high productivity When you’re ready to work, so is your ZD1211. Because when you’re putting in the shifts, day after day, you need a workhorse you can rely on. Visit our website or talk to your dealer now to find out more about the ZD1211’s ultra reliable engine, smooth HST transmission and outstanding cutting capability. Contact your local dealer or visit our website for more details. to do it. “Content needs to be written first, and then looked at to see how it can be altered to suit the various channels, so social media, advertising, PR etc,” says Helen. “It’s important to know what it is you want from the upcoming year, such as marketing a particular brush cutter set, or a chainsaw, or the battery range, then work out how to get videos and photography, and schedule the content calendar,” she adds. Lee comments that online content helps target the demographic you want to appeal to. “So you’re not just firing off 3,000 leaflets to win a couple of customers. With online search, via blog content and website posts you can appeal to your exact customer and save all that paper,” he explains. And as we know, we are only ever one click away from the next new technological advance. “Voice search [rather than keyboard search] could be a big growth area in the next 24 months or so,” suggests Christopher Bassett, adding it’s critical to keep websites updated and easily searchable. Measuring success Lee Burkill is fully booked for the next year, a testament to the strength of his approach. He markets entirely online and through his social media accounts: “I blog and vlog about my work. While it is time-consuming, I find it better in terms of ROI, and more successful than adverts and traditional mailshots. State of the art technology for Landscape Professionals Maggie Walsh and fellow trade journalists gathered on a windy March day at Westonbirt Arboretum, near Tetbury Gloucestershire, to test run some of STIHL’s latest products The STIHL team were keen to show off their latest range of battery powered cordless tools, reveal the latest in technological developments in their petrol range and tease us with snippets of what more is to come out from the German manufactures for the end of the year. First off we took hold of the company’s latest offering in performance blowers. The BR 800 C-E, designed with professional landscapers and local authorities in mind, produces a blowing force of 41N. The 80cc STIHL 4-MIX® engine runs on a fuel-oil mix just like a 2-stroke model and offers the benefits without the compromises of 4-stroke power. It provides fast acceleration, more power, added torque, and lower noise during operation to complete jobs quickly and more easily. In addition, the engine offers reduced emissions and increased fuel efficiency. Furthermore the blower can be started while wearing it, with the handy starting system on the side of the machine, and it also benefits from an automatic choke reset and a switch position on the control handle that is always ‘On’, ensuring that the professional user can start the BR 800 C-E with ease. The intuitive design, also has an ergonomic backpack carrying system including S-shaped shoulder straps for maximum comfort when wearing. Additionally, the BR 800 C-E incorporates STIHL’s anti vibration technology that reduces feedback from the machine’s engine, allowing professionals to comfortably use the tool for extended periods of time. POWER TOOLS the grass catcher box whilst leaving the engine running, or move the mower from area to area without the blade running, but utilising the single speed drive. Designed with a foldable handlebar, the STIHL RM 655 RS lawn mower is easy for landscapers to transport and convenient to store. The new petrol mower utilises large wheels with high quality ball bearings for easy running, while the tread pattern provides better traction, as well as allowing for easy cleaning. Additionally, the bumper strips offer additional protection when mowing next to walls and edges, and can be easily exchanged or replaced if they become marked or damaged to maintain a professional appearance at all times. If the job in hand requires a large areas of mulching, then look to the RM 4 RTP, a self-propelled mower which features a powerful Kohler XT800 Series OHV SC engine that makes light work of mulching tasks, with single speed drive for simplicity ensuring the mower sets itself in motion with the simple pull of a lever. With front wheel drive, the new mower is easy to operate and its 53cm deck can cover large areas of up to 2,500m2. The RM 4 RTP comes with hard-wearing aluminium rims with rubber tyres and double sealed ball bearings as standard, and also offers professional users gearbox and crankshaft protection to further increase service life. In addition, the axle bracket and axle bolts are reinforced, whilst super soft grips provide for comfortable handling characteristics. Owing to the low vibration values, professionals are able to cut grass for many hours without interruption and front and rear carrying handles are utilised to aid transportation. Smart Technology And finally, youâ&#x20AC;&#x2122;ve replenished your fleet of power tools for your day to day labours. All that is needed now are the tools to keep your team and equipment in full working order. Enter STIHL Connected, a new smart technology that will give professional users a detailed overview of key power tool data via a portal in order to enhance maintenance programmes and fleet management efficiencies. Launching in August 2019, STIHL Connected comprises of three central system components; STIHL Smart Connector, STIHL app, and STIHL connect pro portal. When used in conjunction, STIHL Connected enables professional users to easily analyse key machinery performance data that can be used to not only improve daily work processes, but also help achieve optimum task scheduling for an even more efficient team. STIHL Smart Connector is easy to install and transmits the most important power tool data via Bluetooth to a smartphone or tablet, giving users universal transparency about where power tools are being operated and their current status. With the STIHL app, professional users are given a detailed overview of their power tool run time, as well as being able to schedule and document work tasks. The STIHL connect pro portal enables the digital management of an entire machinery fleet, meaning users can add or remove power tools, schedule work to best effect and view pending maintenance appointments. Whatâ&#x20AC;&#x2122;s more, users can see the last position of an active power tool, giving them complete visibility of the whereabouts of any tool, as long as location services on the connected phone are enabled. Plant Pyramid returns to BBC Gardeners’ World Live The Plant Pyramid, supported by Peter Seabrook, returns to the Floral Marquee at BBC Gardeners’ World Live 2019 at Birmingham’s NEC this June, with four new satellite pyramids. The Pyramids play host to a monumental display of up to 4000 plants, all new introductions for either 2018 or 2019. Following their support of the first Plant Pyramid at BBC Gardeners’ World Live in 2018, Dutch breeders Florist return with a brand-new clutch of Garvinea, the Garden Gerbera. The impressive flowers, both in look and number, as well as the ability of this Gerbera to grow outside and in colder climates, makes Garvinea a flowering sensation. Joining them, HilverdaKooij present a new Echinacea, a Dianthus, a pot Alstroemeria and a garden Alstroemeria. Visitors to the show will see these as well as many more new varieties, including Petunia x callibrachoa ‘Beautical’ (tipped to be one of the biggest sellers for 2019) and Nemesia ‘Lady Penelope’ which was awarded the HTA new plant award in 2017, and becoming available in Garden Centres from Spring 2019. HORTICULTURE best quality of build. Our ambition is always to shorten the time we spend building the hard landscape elements on site, so that the planting can be completed ahead of time and can have a chance to settle and establish before the garden is judged. Some parts of the planning are beyond your control, such as the weather! For example, when rain stops play, as it inevitably will, you need to be ready to re-jig your carefully planned schedule to get the programme back on track. Trying to plough through in difficult weather conditions may be detrimental in the long run, as you may end up spending more time rectifying the damage. I’ve found having a good contact book is helpful – to have people to call on when you need the additional help or in rectifying any issues you come across. Being able to pull in a favour from friends and colleagues on site has at times been my salvation. My advice to any first-time landscape contractors building a show garden is to ‘start small but aim high’. I would recommend starting with a smaller garden (such as the Artisan gardens at RHS Chelsea) to give yourself a chance to understand the unique environment of a showground before you progress to a larger garden. slopes in excess of 35 degrees. Its assistance in keeping the body of the machine level also protects the engine by keeping it within its approved manufacturer tilt levels. GreenMech’s Arborist 150p, fitted with a 37hp Briggs & Straton Petrol engine, offers comparable performance to the higher horse-powered diesel engine of the existing Arborist 150, but at a much-reduced cost. It features a generous 970 x 790mm in-feed chute to accommodate a 150mm chipping capacity, while the 150mm x 230mm letterbox-style in-feed throat opening makes light work of brash and heavily forked branches. The Arb 150p also comfortably meets the sub750kg towing restrictions. All of GreenMech’s hydraulic machines are fitted with their patented disc-blade system, providing up to 150 hours of chipping before re-sharpening is required. They also come with a three year warranty, the support of GreenMech’s well-established UK dealer network and a variety of flexible GreenMech Finance options. Kubota UK unveils its new RTV-X1110 vehicle Kubota UK, the leading manufacturer of agricultural, groundcare and construction equipment, has announced its new RTV-X1110 vehicle. ground wheels, and throw it onto a vibrating sieve. The sieve filters any infill material back on to the playing surface, whilst retaining the debris and collecting it in a lightweight hopper, that can easily be removed for emptying. The finish is a revitalised surface with clean infill. A Verti-Clean 1500 has been used as part of the synthetic maintenance programme at Scotstoun Stadium, Glasgow since September 2017. Head Groundsman there, Paddy Ferrie was recently rewarded for his work as he was crowned the winner of the ‘Best Maintained Artificial Surface’ category at the IOG Awards. Top marks as Green-tech deliver on time to new school A newly built secondary school in the North East of England has had its sports pitch constructed and grounds landscaped by Brambledown Landscape Services, one of the UK’s leading Landscaping, Sports Pitch and Groundwork operations. Brambledown Landscape Services turned to Green-tech to supply premium grade Green-tree topsoil, specifically manufactured for high quality sports pitch application. Green-tree advisers met with Brambledown Landscape Services and a soil consultant early in the supply chain process as the material needed to meet stringent requirements for agronomic make up and drainage. It was agreed that the end product would be manufactured using Green Pas100 compost and selected sands. The requirement was for more than 2000 tonnes of Greentree topsoil to be supplied in a very narrow time frame. Service & Ease Quality clean seed Seed proven in UK and European climates, and wherever possible, grown in the UK Mixtures designed by experts to perform in the correct situation or use. Thumbs up for Cub Cadet in Sweden Cub Cadet INFINICUT® mowers, used by sporting venue groundsman across the world, have been specifically designed to offer the operator the ability to alter geometry and working parameters to ensure sward consistency is retained regardless of the time of year or conditions encountered on. This attention to detail by the US manufactures has recently impressed Robert Adamsson, grounds manager of Sweden’s Rimnersvallen Stadium (home to Ik Oddevold and Rössö IF football clubs), who recently purchased a Cub Cadet INFINICUT® 34” mower. The multi-use stadium, which played host to Pele’s first World Cup match in 1958, is currently under redevelopment with the changes including taking delivery of the new mower. Robert, who is supported by three grounds staff, explains his choice of new machine. “The first, and perhaps the most important thing for us, is that it runs on battery power making the mower very quiet, which means we can get out and mow early in the morning. “The whole team use the INFINICUT® and have been impressed with how easy it is to use, and how simple it is to adjust the cutting position. The quality of the cut it produces has dramatically improved the appearance of the pitch, which hasn’t gone unnoticed by the players and the fans.” Plant health can only be augmented by choosing the correct equipment set-up for the circumstances that prevail at any given time. Setting the mower with an attitude angle that is too aggressive can weaken the plant during times of plant stress allowing pathogens to more easily ‘take hold’. Frequency of clip (FOC) is important in ensuring the correct quality is achieved for the specific height of cut as an incorrect FOC can mulch the plant leading to an unclean cut and an increase risk of disease. to-use controls including a geared deck-lift system that allows the operator to change the cutting height with ease. The pedals and levers are all positioned within easy reach and are engineered to be lightweight in use. The dashboard display with running hours, cutter deck and Powered Grass Collector status indicators is visible at all times. Access on and off the tractor is made easy with a shaped steering wheel and adjustable seat position. The heavy duty cast axle helps the machine to withstand the stresses of uneven terrain, while the strong, durable, single pressed steel body is built for longevity. When it comes to maintenance nothing could be easier with easy access to the engine area and the translucent seven litre fuel tank for checking fuel levels. Above all the C40 is a Countax with a long British heritage, offering premium performance at an entry-point price. Visit www.countax.co.uk to find local dealers. scale, 2700K is our warmest white colour temperature, and thanks to the Landscape Lighting range, this indoor cosiness can now easily be brought outside. Landscape range: 2700K additions The Landscape Lighting range is all about making exteriors feel inviting and interesting, and can now feel even cosier with 2700K warm white light. This colour temperature is available for a variety of different products to easily illuminate any outdoor area, and a combination of these light fittings will help to create a layered lighting design which achieves the same warmth and depth of an interior space. Products include step lights, spike lights, wall lights, strip lights and ground lights, rotatable pond lights, marker lights and bollards. For more information about the 2700 Kelvin Landscaping range, visit www.collingwoodlighting.com. An Environmental Initiative Rigby Taylor, in its 100th anniversary year, is heading a major initiative to assist in reversing the national decline in pollinating insects. Itâ&#x20AC;&#x2122;s called Project Pollin-8. Project Pollin-8 is a range of 10 specially developed Euroflor flower seed mixtures which has been introduced to supply longer seasonal sources of nectar and pollen, whilst at the same time providing incredible flower displays. In particular, a new mixture Euroflor Banquet contains the best species for pollinators, whilst delivering a high performance display. Banquet is the result of information obtained from independent research data published by the Urban Pollinators Group* (UPG). Sown from March through to June, flowers appear 50-55 days after seeding and will provide a riot of colour until the first frosts in late Autumn. For a comprehensive Euroflor brochure ask your Rigby Taylor contact or Freefone 0800 424 919. Also as part of this initiative, Rigby Taylor has launched a new website that details more about Project Pollin-8 and showcases all the Euroflor mixtures currently available. â&#x20AC;&#x2DC;*The Urban Pollinators Group (UPG) is a national research programme on urban pollinators run by Bristol, Edinburgh, Leeds, & Reading universities (2010-2013). Contact us today for a FREE brochure featuring over 200 British products, or visit our website to ﬁnd out more. For all your golf, sportsturf and landscape irrigation needs. Sprayers, Trailers, Water Units, Lawn Care, Leaf Sweepers & Suckers... & Much More!